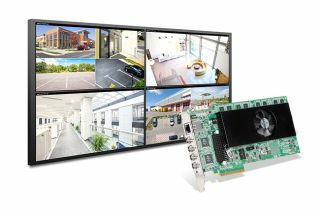 Matrox Graphics announced a new Matrox Mura IPX 4K IP decode and display card and that its popular MuraControl video wall management software for Windows and iPad has been updated to suppport two models of Matrox C-Series multi-display video cards C900 with nine outputs and C680 with six outputs. The latest addition to the Mura IPX Series family line, the new Matrox Mura IPX 4K IP card offers H.264 decoding of one 8K, up to two 4Kp60, four 4Kp30, eight 1080p60, sixteen 1080p30 or many more SD streams. Additionally, four DisplayPort outputs making it a cost-effective, easy-to-integrate multi-viewer for control rooms and AV presentation systems in security, corporate, defense, aerospace, utilities, government, medical and education environments. Matrox Mura IPX will be demonstrated at InfoComm 2016 (Las Vegas, June 8–10) in booth N2047. MURA-IPX-O4DF is a PCIe x8 Gen2 card featuring 4K video display in 32-bit color on each of the four DisplayPort outputs that delivers high-density H.264 decoding up to Level 5.2. AV integrators are provided all of the controls to deploy video walls with Matrox MuraControl video wall management software and the Matrox Network API enables ISVs to expose new capabilities within their own software. Added functionality specifically for multiviewer applications has been integrated into the cards, with text overlay to indicate window titles, stream sources, locations, or zones, and onscreen clock providing a temporal reference for accurate stream monitoring. Intuitive MuraControl software allows the management of Mura IPX decode and display powered multi-viewers from a console system or remotely using the MuraControl for Windows software or MuraControl for iPad app. Easy-to-use APIs can be leveraged for precise stream management using both local and network-based custom user interfaces. The expanded Matrox video wall portfolio enables OEMs and system integrators to easily and cost-effectively target a wider range of small to mid-sized video wall installations. Support for Matrox Network API has also been extended to C-Series, enabling ISVs to expose new capabilities within their software. The complete Matrox video wall product line up will be demonstrated at InfoComm 2016 (Las Vegas, June 8–10) in booth N2047. MuraControl for Windows is a feature-rich, single-license software that lets users create, save and edit video wall layouts offline or in real time so their content appears exactly where and how they want it. MuraControl for iPad is a free app that provides a touch panel control interface for remote video wall management. These applications give AV integrators all the basic controls they need to deploy video walls for digital signage, corporate and control room applications. Matrox Network API is a command-level API that can be transmitted from any network computer including PCs, smartphones and tablets and used through Telnet, RS-232 and HTTP/HTTPS. It gives ISVs easy control and manipulation of Matrox-driven video walls though their own applications as well as access to advanced capabilities such as layout management, source management and compositing using alpha blending, color keying, and text and image overlay. Applications that have already been coded with Network API for the Mura MPX platform will automatically support the C-Series platform. “The expansion of these software tools to C-Series gives video wall integrators and system builders everything they need to create inexpensive, yet versatile and powerful video wall solutions,” said Al-Bayaty. Matrox C-Series multi-display video cards deliver outstanding performance, stability, and usability to power video management systems and small-scale display walls in control room, digital signage, enterprise, industrial, security, A/V, and embedded system applications. Matrox C900 is the world’s first single-slot graphics card to drive nine 1920x1200 displays for 3x3 and 9x1 configurations. Matrox C680 supports up to six 4K/UHD displays.